Chicago is often fondly referred to as a “city of neighborhoods”. A big city broken into 77 communities and over 200 neighborhoods, at which the heart of each centers around culture, cuisine and small businesses. 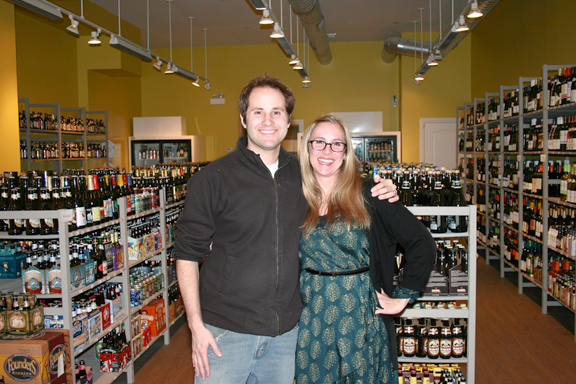 One of North Center's latest neighbors turned business owners are Joe and Carly Katz, the dynamic duo behind Bottles and Cans, a craft beer focused retail store. The shelves are stocked with a wide array of local, national and international offerings, as well as wine and liquor. In addition to isle after isle of 6-packs and 22oz bombers, they also feature a "build your own" 6-pack option, which is unique in that it can be comprised of anything in the store, since each bottle is individually priced. “If someone wants to build a $30 all Belgian beer 6-pack, who am I to stop them?” says owner Joe Katz. Finally, someone who understands and delivers what the true beer fanatics are looking for! 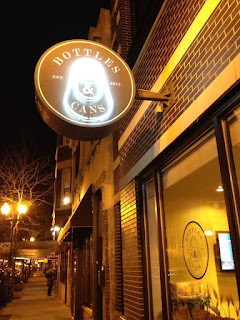 I had the opportunity to stop in and interview the lovely pair on how Bottles & Cans came to be and what the future holds for this neighborhood gem. How did your interest in craft beer begin? Joe: I came from the distribution side, started off in wine and spirits and about 5 years ago took a beer job with a local distributor. Over time it just blossomed my love for and knowledge of beer. I started the Cicerone program, passed Level 1 and am studying for Level 2. Carly is also studying for Level 1, so it’s been exciting to learn about beer together. We both also want to further our wine knowledge together. What made North Center the right location to open a beer store? Joe: We knew that this neighborhood would welcome a retail store featuring first and foremost craft beer. There are a good number of fine wine stores, but not many beer-first stores. So ultimately we found this place two blocks from our home and did some diligence realizing that Bad Apple, Half Acre, Brewcamp were down the street, as well as a million little breweries popping up - and decided to go for it. The Alderman was so receptive and helpful, along with the neighborhood. What has it been like being a newcomer to the Chicago craft beer scene? Carly: Super warm and inviting. Everyone has been awesome - brewers swinging by, neighbors introducing themselves, bloggers like yourself reaching out. Everyone wants everyone to do well in this community. Joe: It’s been almost shockingly pleasant. Beer people seem to have much more of an “everyone can play together” mentality. We find it to be a much more laid back, friendly, creative side of the beverage industry. Who do you feel embodies today’s craft beer drinker/enthusiast? Carly: Can I tell you, it is everyone! It’s one of my favorite things about this industry. We have everyone from hipsters and musicians to young families, older folks, males, females... It’s awesome and I can’t believe how vast the crowd is that comes by. Joe: I couldn’t believe during the holidays how many people came in to buy gifts of beer for other people. People are either into craft beer or want to get into it. As a business owner it’s great, but even from a observing standpoint it’s such a cool trend to see. I think a big part of it in this community is the homebrewing side - people are aware and open to trying so many new things. Any particular beers or breweries on your personal “wish list” for the store? Joe: Oh my gosh, this could take awhile. One of them arrived in last week - Deschutes is a brewery I’ve been obsessed with for awhile. Chicago is becoming a huge craft beer destination and with some of the bigger guys like Deschutes and Kona entering the market I think it will open the door to some others like Alaskan, Odell, 21st Amendment, which we would love to see come into Illinois. When Oskar Blues came in 4 months ago it was a great moment too. And obviously we're excited for all of the Chicago craft beers. Spiteful Brewing came over to introduced themselves and then went back to the brewery, picked up a case and walked back to share with us, so nice. We’ve tasted some of Begyle Brewing’s beer, which was amazing. We’re excited to see all of the additional local stuff popping up. What are you the most excited about in the upcoming year? Joe: I’m excited to see how we can continue to reach out to the community. Every day we get repeat customers which is wonderful and equally important we’re getting new customers. I love see the reactions from people when they walk in and realize what we’re trying to do [with craft beer]. Carly has been coming up with some really fun events. We want to start doing seminars and classes. Like anyone we have a thousand ideas so it will be exciting to see which ones we can put into action. Carly: It’s always fun to see new people come in and hear that first question of “how long have you guys been here?”. We’re excited to have our first employee and equally excited to start paying ourselves [laughs]. Seeing what the new breweries bring in is fun every day. Joe: Bottom line - we’re excited, we’re ambitious but we’re also still trying to keep our feet on the ground. It’s been a great three months, but it’s only been three months. The neighborhood is filling our head with of reasons to be optimistic. We hope it continues and we’re excited to see what comes of it.